Sigiriya is primarily famed because of the Rock that it houses. The rock has been bestowed a unique identity in the form of its spectacular shape. It seems to be a cloud as it is standing tall with a height of some 180m. Nowhere else in the world one can find such classic beauty. Sigiriya is a unique blend of ruins which perfects the image of a 'Lion in the form of Mountain' and proves to be an ideal heritage site. The pictorial style of this place has been mesmerizing visitors since 6th century AD. Apart from the glorious heritage that it comprises, Sigiriya holds a strong past with a majestic history behind its emergence. Sigiriya is an enigmatic tale of grandeur, beauty and tragedy. There are only a few places in the world which can match the glorious history of Sigiriya. The place is a bountiful blend of mesmerizing vistas, alluring artifacts, magnificent history and fascinating heritage. 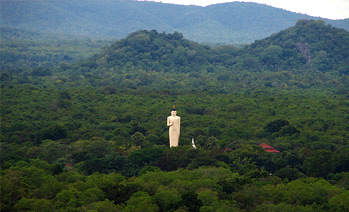 The place has been enriched with such natural beauty that no other place in Sri Lanka can even stand in front of it. Apart from the natural beauty, Sigiriya is eminent for the frescoes emblazoned and the poems inscribed on the rock in the Sinhalese language defining the literature and thought of the time. The Sigiri graffiti depicts the thought of that century and intrigues the visitors to explore more and more. The best attractions of the place which leads it to be an eminent heritage site are mentioned below. Sigiriya Rock Fortress has been exclusively designed for defense purposes as it has been artistically adorned with battlements and moats. There are different entrances to commence the journey of this fortress but the most desirable one is the Western entrance. Sigiriya Museum affirms to be one of the most admiring museums of South Asia. Looked after by the Central Cultural Fund, this museum is a place where one can exclusively explore the Three decades of archaeological research on Sigiriya Sri Lanka. The museum has been sophistically designed to be a representation of the original Sigiriya. It exclusively follows the concept of Green Building, ascending terraces and the wide stairways beautifully adorned with trees and water. 8:30 AM – 5:30 PM are the timings in which the general public can explore it. Pidurangala Rock is positioned beside the north of the eminent Sigiriya rock fortress. It looks like a hill made out of a massive rock formation. 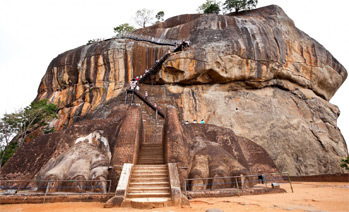 Pidurangala rock, a result of a volcanic eruption, is a little more complicated to climb in comparison to Sigiriya rock. It is mostly overlooked by travelers because of the reason that it is not grandly promoted and offers difficulty in climbing. The best part which it exclusively offers to the travelers is the enigmatic vistas of the Sigiriya rock amidst the woods with a backdrop of the sun setting quietly to its place. Nobody wants to miss that mesmerizing view which can only be found in this rock. How to reach Sigiriya: It’s around 165 kms away from the capital city if Colombo and well connected to other parts of Sri Lanka by cabs, buses, trains and plane. The best way to reach the place is by road. It will save you time as and won’t create a hole in your pocket. Best time to visit Sigiriya: It is advisable to avoid climbing the rock at afternoon hours as the place then would be like too-hot-to-handle with the sun on top. It is considered better to travel from July to December in morning hours.